TN CM Edappadi Palaniswami issued a statement appealing for calm and promised to take action respecting the sentiments of the people. Tension simmers in Thoothukudi after protests against the Sterlite plant turned violent on Tuesday. As per Governor Banwarilal Purohit's statement 11 people including women have been killed and over a dozen injured following clashes between police and demonstrators. According to some reports a police man was also killed in the violence, however, this is yet to be confirmed by officials. Following clashes, police resorted to a lathi charge, firing tear gas to disperse the crowd, even protesters retaliated by pelting stones. Visuals also showed a police van that had been toppled over, while many private vehicles had been set on fire. The Collectorate was also ransacked by protesters. "I am standing outside the government hospital. Four people have died including one woman protester. At least 25 others are severely injured. The police were firing indiscriminately. We are afraid that more people will succumb to injuries. We were forced to hit back at the police because they attacked our women and children, How can we just quietly watch?" alleges Kittu, 43, protester. By some estimates, at least a lakh protesters participated in the rally called to demand the closure of the Sterlite copper plant, which allegedly posed health threats besides causing damage to the environment. "The protests began peacefully with one lakh agitators. They were all heading towards the Collectorate and were walking on the Palayamkottai road. But when they were stopped and lathi charge happened, they began burning bikes of police officers and barricades were pushed away. The atmosphere became violent and mob-like. Things intensified when we arrived at the Sterlite quarters. A lock was broken and people began to light cars on fire. The protesters were also carrying petrol bombs. Journalists at the site were also attacked. The police were largely outnumbered. And people began falling back only after the police began shooting," said Elena, freelance video journalist. Following the violence, Chief Minister Edappadi Palaniswami held a meeting with senior ministers Kadambur Raju, Jayakumar, SP Velumani and Anbalagan. TN CM Edappadi Palaniswami issued a statement appealing for calm. “Government will respect sentiments of people and take action accordingly,” stated the Chief Minister. The CM also announced compensation of Rs 10 lakh and a suitable government job for the family of those killed in the violencce, and Rs 3 lakh compensation for those injured. An inquiry commission will also be set up to probe the violence, stated the CM. Speaking to the media, Fisheries Minister Jayakumar said, "Tamil Nadu is a garden of peace. No matter who initiates it, violence is unacceptable. The district administration and police are taking measures to bring things under control. The matter regarding alleged violations by Sterlite is already in court. We have to investigate who started violence and why there was gunfire. There is no clear data yet on how many people have died or been injured." Claiming that the police firing was unavoidable, Jayakumar said that the mob was approaching the Collector's office. Meanwhile, DGP TK Rajendran stated that the situation has been brought under control and urged people not to panic over the violence in Thoothukudi. He also promised to inquire into whether the police had committed any excesses. “Things are under control. Police were reacting to the violence. Will give details on casualties shortly,” said Inspector General of Police (South Zone) Shailesh Kumar Yadav. Shops and commercial establishments have also reportedly been shut down. In view of the protests, the Thoothukudi Collector had issued prohibitory orders under section 144, with permission granted to stage a protest only at the SAV ground near Thoothukudi, reported The News Indian Express. However, protesters decided to march the Collectorate. The DMK has hit out strongly against the ruling AIADMK government over the tense situation in Tuticorin. In his Twitter account MK Stalin wrote: "ADMK Government is responsible for the violence in Tuticorin. They never bothered to find a solution to the people's problem in that area. They were negligent. I strongly condemn the govt for not providing adequate security despite knowledge of the protest beforehand. 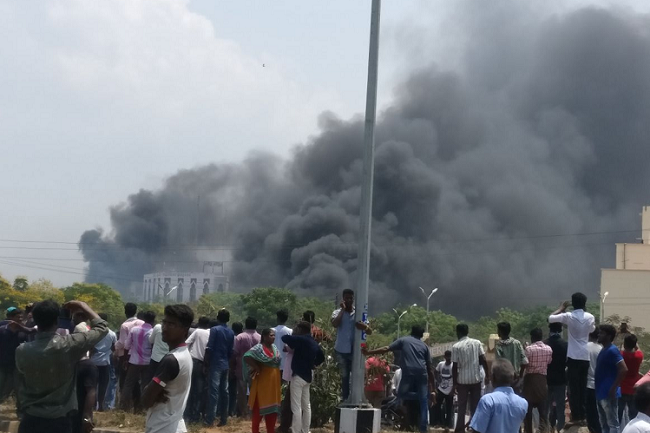 In wake of these protests, TN govt should immediately ensure closure of sterlite plant"
"This seems like an effort by the police to stop protests against Sterlite. Discussion are required in this matter. People have carried out a huge revolution but police have turned it violent. They have even shot people and this regrettable. I condemn the actions of the police," said DMK working President MK Stalin. Rajini Makkal Mandram chief also reacted, reportedly stating, "This government's behaviour - of disregarding people's feelings- that has resulted in the shooting of the public is saddening and condemnable. The Tamil Nadu government is responsible for the violence that has happened and the lives that were lost."